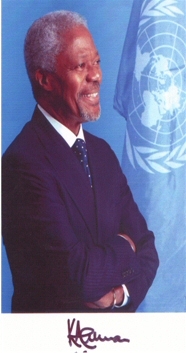 On January 13th 2004, Koffi Annan, Secretary General of the U.N. gave the “Inaugural Robert Burns Memorial Lecture”. At the end of his speech Secy/Gen. Annan stated “Finally, while I know this is not a traditional Burns Supper, I do hope that you will let this hungry Secretary General try some haggis at some point in the near future”. Upon receiving a copy of the speech RBANA President Jim Cunningham and his wife Jean, RBANA Secty/Treas. put out an urgent call by e-mail to RBANA members to answer the call and provide Koffi with a “wee taste o’ haggis”. Two associate members in Florida, Barbra Bartz and Frank Campbell took upthe challenge and decided to get Koffi his Haggis. These words uttered by Koffi Annan in his speech at the UN in January 2004 caused the RBANA President and Secretary to send out the call to Burnsians to grant Koffi his wish that he be allowed to partake of this delicacy. After an exhaustive search of the hills around Waterloo, Ontario ( where the Haggis was known to roam prior to the birth of Robert Burns) one was found but unfortunately USDA does not permit the transportation of dead or live haggis from Canada to New York. Acting on the direct orders of the RBANA President, two RBANA Associate Members in Florida, Barbra Bartz and Frank Campbell took up the challenge. 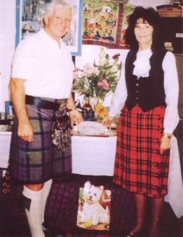 Together they alerted Jim Martin, President of the St Andrews Society of Sarasota who contacted Sheila Jackson, owner of the “Scots Corner” in Sarasota. 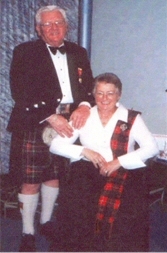 For many years, Sheila has been supplying Haggis to the St. Andrews Society for their Burns Suppers. They all agreed that they should catch a Florida Haggis and send it to Koffi. 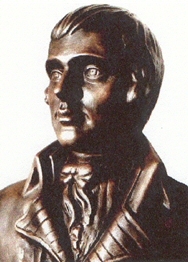 Hunters, Frank and Barbra, assisted by fellow Burnsian and RBANA member Robert Fraser, were most fortunate to bag a fine specimen near the Scots Corner in Sarasota. 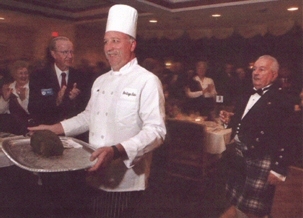 With the collaboration of Jim Martin and Sheila Jackson, our hunters arranged to grant Kofi’s wish and on being informed that a Haggis had been procured and was ready to be shipped to New York, the RBANA President suggested that it would be prudent to inform the UN that a haggis was on it’s way. After all we did not want this great delicacy mistaken for a bombby some “Sassenach” security agent. The intrepid Floridians told Jim that they were not worried as they would just put his name on it!! Finally the Haggis, packed in dry ice, was ready for shipment. Although in New York, it could have been lox. Who could have sent this? - such a brown looking blob. It’ been undressed, redressed and addressed before. 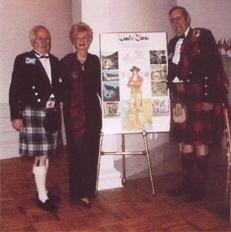 In February a letter was received from the Office of the Secretary General, thanking everyone for the gift of the Haggis Enclosed was an autographed photograph. We have not heard How Koffi enjoyed his Haggis.